So, some of you have noticed that I haven’t been exactly diligent about posting over the last few months. In fact, back in May I was plotting out quite the summer for megansmark: I would get creative with the boatloads of veggies from our first real garden, share some of my favorite Italian seafood recipes that are just right during our hottest months, and explore local creameries and farms here in Maine. It was going to be a summer of eating, and it was going to be great. Indeed it has been a memorable summer, and a good one, though I cannot characterize it as one of eating. More like the summer of not eating. The summer of revulsion by Swiss chard and lettuce. The summer of if-I-eat-another-bite-of-this-delicious-grass-fed-beef-I’m-going-to-hurl. The summer of my first pregnancy. Yes, I am hosting a small and increasingly endearing little human, not too far from where I’m pretty sure my stomach used to be (I believe it is subletting some space from one of my lungs or pancreas). Thus, the months of June-August presented me with a bit of a challenge – how could I stand to write about food when I didn’t even want to eat it? While I eked out a few stories, like the one on a rhubarb custard pie that I couldn’t eat, and some delicious grilled lamb and tzatziki that took me nearly a week to recover from, my preferred menu looked a little more like this: scrambled eggs, almonds, yogurt, water, yogurt, a muffin, toast, cheese, and almonds. There were a lot of almonds and yogurt. It didn’t make for very exciting writing. Happily into my second trimester, I am back to enjoying most foods, once again excited to be eating, and to be writing about food. The little munchkin is kicking, which I take to mean that s/he is going to be an eater, as well. Yesterday I celebrated this recent chapter by eating half of a homemade coffee cake. I happened to have a sunny Maine morning to myself at home, a few handfuls of backyard blueberries from my friends, and a container of sour cream in the fridge. The night before I had demolished a giant quesadilla which I had frosted an inch thick with sour cream, and I was feeling some real admiration for the dairy product. It has calcium, after all, which the kicker and I need a lot of. I pawed through my old Fanny Farmer Baking Book for a recipe, and ended up retrofitting the their Sour-Cream Coffee Cake. I could not have been more pleased with the outcome – it was like feasting upon an overly generous muffin. Excuse me for a moment while I sound like the Duncan Hines commercials of my childhood, but this cake was moist, airy, and buttery. 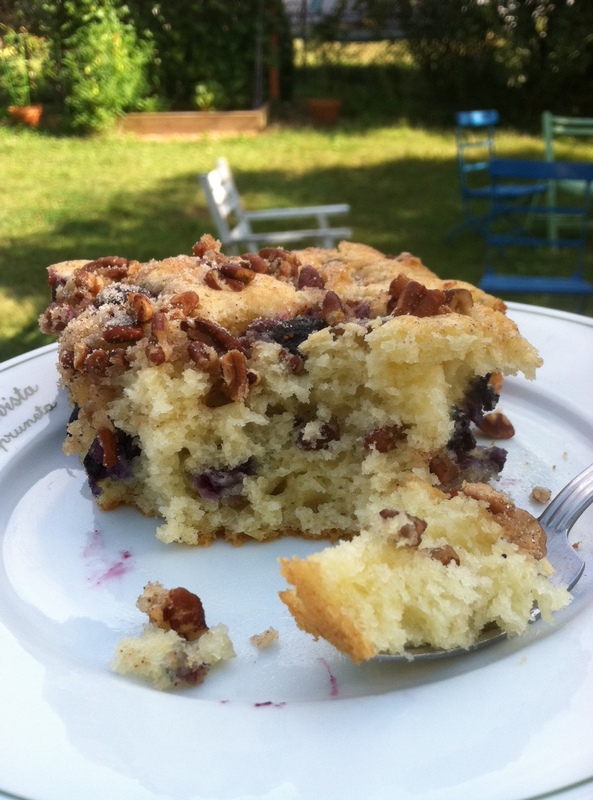 The big high-bush blueberries provided a good bite of freshness to the otherwise decadent cake, the pecans much needed crunch. This has to be the best part of pregnancy, I thought, bringing two large helpings out to my Adirondack chair. Sweet justice for three months of nausea: cake for breakfast and a glass of whole milk to wash it down. 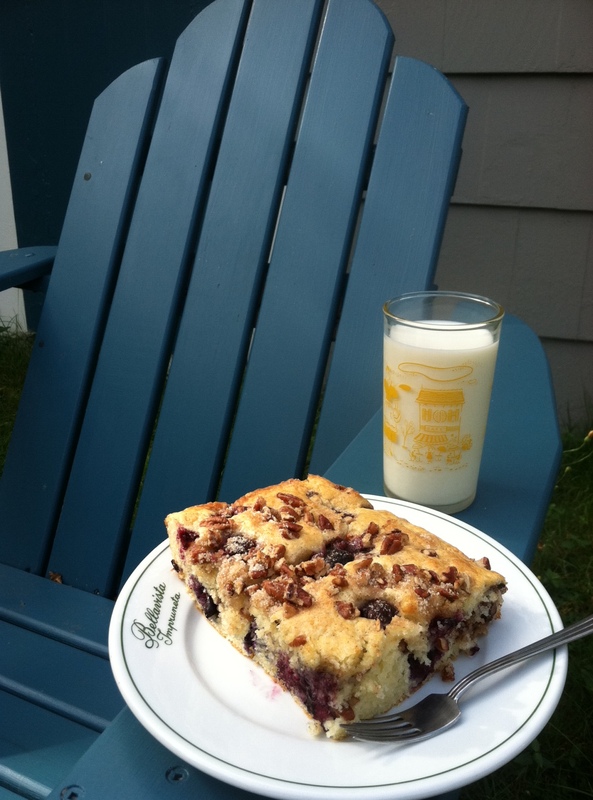 Pregnant or not, in the spirit of hard work (it is Labor Day weekend, after all) I think everyone deserves, and should enjoy, some breakfast cake before summer packs its bags. The quick and easy recipe follows. Grease and lightly flour an 8-inch square baking dish. In a large mixing bowl, cream together 1 stick softened butter and 1/2 cup sugar. Whisk 2 eggs and 1/2 cup sour cream into the butter-sugar mixture until well blended. In a separate bowl combine 1 1/4 cups cake flour, 2 teaspoons baking powder, 1/2 teaspoon baking soda, and 1/4 teaspoon salt. Using a spatula, gently incorporate the dry mix into the wet ingredients until the batter is smooth. In another bowl mix together 1/4 cup sugar, 1 teaspoon cinnamon, and 1/2 cup chopped pecans. Then add about 1 cup blueberries, tossing to coat the berries well. Spread a little more than half of the batter in the prepared dish. Sprinkle most of the blueberry-pecan mix over the batter, reserving about a third of it. Spread the remaining batter, and then top with the remaining berry-nut mixture. Bake at 350 degrees for about 30 minutes, or until the surface is just beginning to turn golden and a toothpick inserted into the center comes out clean. This treat is most delicious when served warm!